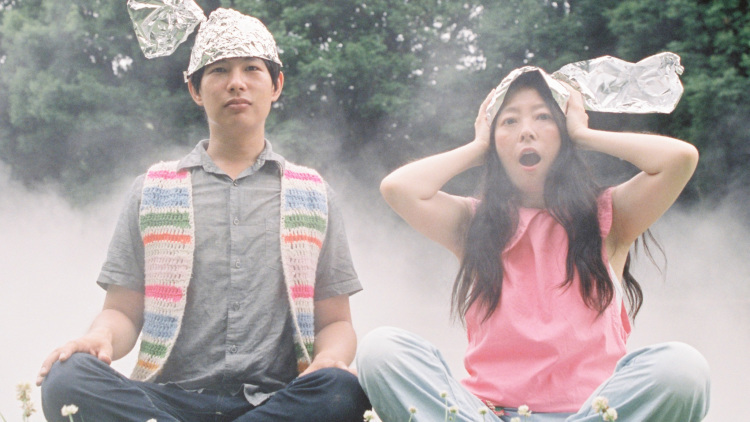 Guitarist Dustin Wong has kept busy since the demise of Baltimore art-rockers Ponytail, releasing a trilogy of solo albums through local Chicago label Thrill Jockey Records. With the help of effects pedals, Wong is able to single-handedly create lush, instrumental songs that display both his technical ability as a guitarist and his immense creativity as an artist. Since moving back to his childhood home of Japan, Wong has collaborated extensively with experimental pop musician Takako Minekawa. Last year, the pair released the playfully psychedelic album Toropical Circle, a collection of songs rooted in improvisation. On Saturday, Wong and Minekawa will perform at the Hideout, debuting songs from their latest record, Savage Imagination. Ahead of the show, we spoke to the duo about artwork and virtual pop stars. Wong translated for Minekawa. Wong: We met two years ago when Takako came to my solo show at a gallery space in Tokyo. There was a painter in the in crowd who was a mutual friend of ours and he introduced us. We were in touch through email for about six months and then we started sending music to each other. It wasn’t until the next year that we started playing together. Minekawa: I knew of Dustin’s music before I met him and I was a big fan. Wong: The same goes for me. I listened to [Minekawa's album] Cloudy Cloud Calculator a lot when I was in college. Did you approach the recording of Savage Imagination any differently than your first record? Wong: It was pretty much the exact same process—we went one layer at a time. The ideas behind each song were more developed; there are more complex rhythms and we experimented with harmonies. Minekawa: We were able to trust each others sensibilities more and that became a new energy. Why did you decide to create the diorama which became the album's cover art? Dustin: Takako bought this wooden board at an art store and brought it to her apartment. She really wanted to make a painting, so we started painting on it. It didn’t feel right so we decided to incorporate clay, aluminum foil and layers of paint and drawings. Wong: It’s very similar to the way we make music, because it’s all based on improvisation. We simply record the improvisations and pick out what works. How does your music fit into the musical landscape of Japan? Minekawa: I often wonder what Japanese people think about our music. A lot of music gets put into very specific categories here. I don’t think that we fit into those categories. We’re outsiders. Wong: There’s this very surreal, patriarchal and misogynistic music scene in Japan that includes the idol groups and the Hatsune Miku vocaloid stuff. The idols are already this almost virtual concept, but vocaloids using synthesized voices to recreate human voices takes the concept one step further. [Minekawa and I] started using an Auto Tune pedal and it felt like we were trying to accomplish a similar thing. Our process is organic but at the same time we’re entering a virtual filter. I feel an affinity for that kind of distance from reality, through I don’t agree with some of the results of this approach. I actually had an interesting moment recently that helped me realize the power of anonymity and identity. I found an artist through Facebook and I really liked their music, so I followed them on Twitter and this artist messaged me. They told me that they knew me and were able to tell me where I met them. When I finally recognized the person, it took something away from the music because the mystery wasn't there anymore. Do you fantasize about maintaining anonymity as artists? Minekawa: No, we're trying pretty hard to get our music out into the world.